I recently bought the graphic novel Y: The Last Man. It's the story of the world after all the men are killed by a mysterious plague. All the men, that is, except one. The story is told in 60 issues that were released between 2002 and 2008. I bought the collection, which consists of set of 10 paperbacks, from Amazon a week ago. My copy of book 10 was circumcised. How appropriate. The night I received the order, I was reading the first issue on the subway. A fellow passenger saw me reading it and said it was a really good series. It was nice, for once, to have a civilized interaction with a stranger in New York. Today I was reading the totaling the last volume. It has 166 pages. I get to page 120, and as I go to read page 121, I discover that it's not there! The book goes from page 120 to page 97. I flipped ahead and realize that pages 121-144 are missing, replaced with a duplication of pages 97-120. Let me put this into perspective. I had read 1,419 out of 1,465 pages. Granted, it's a comic book, but still. I had read 97% of the story. The last 3% - where the story finally gets resolved - I can't read because half of that 3% is missing! Dude just wait for the movie to come out. I heard it's being directed by Tarantino. Starring Mos Def and The Roc. Then you better check your hearing. 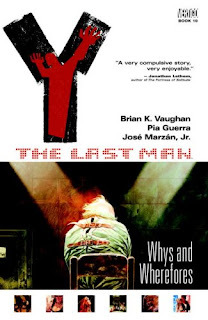 The name of the book is "Y: The Last Man". Why would they cast 2 men in a story about 1 man? You know how Hollywood adapts books for the big screen! The title of the movie will be called XY - The Last Dude. Yes the Roc is the main character and he drags around a dead body pretending its still alive (Mos Def). I think its a play on the volleyball thing that Tom Hanks had going on in Cast Away.